Samenvatting h2 t/m h6 en h8 (tussentoets 1) 2017-2018 Consumer and Marketing Summary (323623) from the book by Michael Solomon (2018): Consumer Behavior: Buying, Having, and Being. Global Edition 12th edition ISBN: -13: 9781292153100 This summary concerns chapters 2 through 6 and 8. This is the substance for the first interim test that will take place on February 22nd. In addition, this summary can also be used for the (re) exam. Summary (Entire Course): CM2062 Consumer Behaviour & Marketing Action A full summary of the course CM2062 Consumer Behaviour & Marketing Action, including all chapters required for reading from Solomon (2017), articles and all lecture notes (examples included). Consument en Marketing Tussentoets 1 22-2-18 This summary is written for the course Consumer and Marketing (formerly Marketing 2). It is a summary for the first interim test (22-2-18). Chapters 2 - 6, 8 from the book are discussed. Summary Consumer Behavior CH1,4,5,6,7,8,9,10. By Solomon & Michael R. This extensive, but simply written summary of the book Consumer Behavior will lead you through the topics in a logical way and will help you to understand the topics being discussed. The summary is filled with illustrations that clarify the theories and models per chapter. By reading this summary only, there is no need to read the book in order for you to pass the exam. Good luck! Volledige samenvatting Consument en Marketing Tussentoets 1. Hfst 2t/m6 en 8. The complete summary of chapters 2 to 6 8, for the first intermediate test of Consumer & Marketing. Clear summary with all concepts and models. Practice Exam Consumer Behavior, by Solomon and Michael R. CH1 - 8. 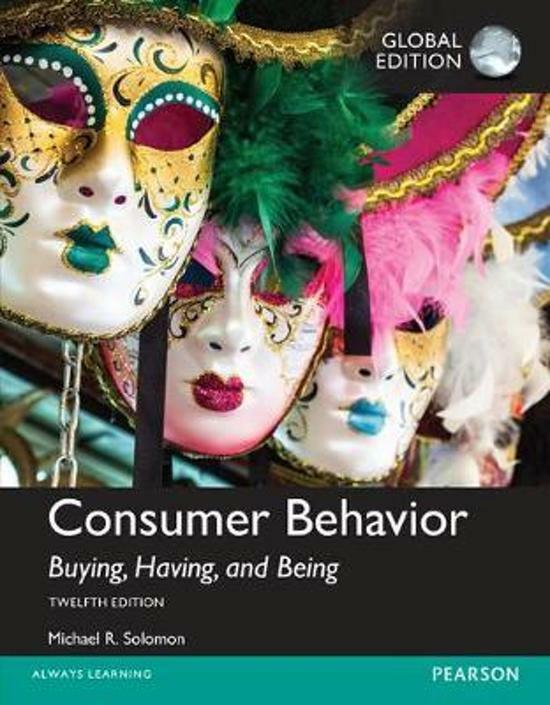 This practice exam of the book "Consumer Behavior: Buying, Having, Being" by Solomon & Michael R, questions you about the most important topics of CH1 to CH8. The questions are formulated the same as can be expected during the exam and will help you learn about the most important topics. Meanwhile, the practice exam makes you aware of the silly differences that are hidden within the theories and models. Includes questions and answers. On this page you find summaries, notes, study guides and many more for the study book Consumer Behavior, written by Michael G. Solomon. The summaries are written by students themselves, which gives you the best possible insight into what is important to study about this book. Subjects like Marketing 2, Consumer Behavior, Solomon, Customer Relationship Management, Summary, Marketing, Consument en Marketing & NHTV will be dealt with.